It seems to be a matter of faith that the ICC is acting purely for the sake of money. It was even part of the justification David Richardson gave for shifting to a 10-team world cup: that they needed the money to fund programs. We Fisked those comments at length on the last podcast, but there is another nagging issues, related to the quote above. The ICC does a poor job of making money for its members. Four examples will suffice, though I suspect there are more. The ICC annual reports detail the profits made on various global events. The World T20 was a big unknown (if it existed at all) when the previous rights were being negotiated, but quickly became a key product, bringing in $78m in 2009, $105m in 2010, $129m in 2012 and approximately $150m in 2014. Then the ICC decided to have it only every four years. There is no replacement, nor is there any indication that having it on a four year cycle will increase the rights value. There are (perhaps) a few savings in qualification costs, but the last WT20 qualifiers had a broadcast partner and made a small profit. In short: the ICC decided to forego in the order of $300-400m in revenue over the eight-year cycle to make the WT20 a four year event, starting in 2016. The choice of 2016 was in itself interesting. The ICC commissioned a report to examine the costs and benefits of being in the Olympic games. They measured the costs assiduously, noting both that England would be disadvantaged - though they exaggerated the degree to a ludicrous extent, claiming to lose �160m for what amounts to a two week gap in their schedule - and that the $85.5m in revenue distribution from the WT20 was not offset by the $14m cricket would receive from the IOC as an Olympic sport. But this was predicated on their being two WT20 tournaments in a four year cycle and that one would conflict with the Olympic tournament. Otherwise the ICC was merely giving up the chance to get an IOC distribution. Nevertheless, through a miracle of board incompetence, the ICC achieved both those aims, stifling any opportunity to promote cricket through the Olympic movement. The $14 million figure was, nevertheless, also a gross exaggeration. National Olympic committees routinely give large funding grants to Olympic sports, in the hope of qualifying, or achieving a medal. And for western nations these are not small amounts. Germany spends �130m a year on Olympic sports. Numbers ten times what the ICC currently gives to associate nations are routine. In Second XI, Sahil Dutta reported the figure as $20m from various bodies in China, even before other benefits from exposure and programs are included. On the other hand, the ECB will host India for 5 tests, 5 ODIs and a T20 in 2018, in addition to 5 ODIs and a T20 with Australia. How fortunate for them, that the WT20 is no longer in potential conflict with their most lucrative tour. The cricket world cup consists of 49 matches, around 400 hours of programming and earns somewhat more than $500m USD in television revenue. 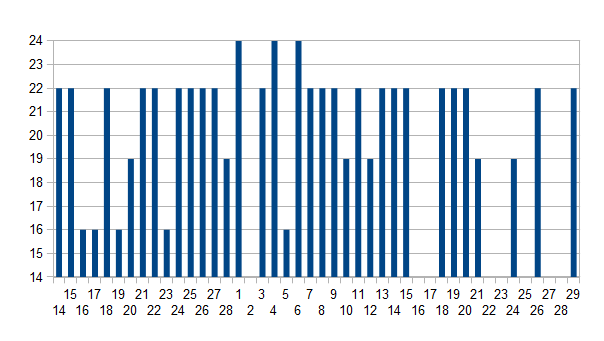 The graph above shows the ending times (more or less) for each day of the world cup in AEST. Notice that there are gaps; there are also gaps in the mornings of most days - though mornings have half the viewers of the evening. All told, there are some 50 hours of Australian prime-time / Indian afternoon that is not being used. The consequences of this are two-fold. The first is that it stalls momentum in the tournament. A home world cup should never leave local fans with nothing to watch. Secondly, while having one game per day ensures matches aren't competing for a tv audience, when 70% of that audience is (largely) interested in six specific matches, the others are gravy. The cost of putting on a match is a long way below the value of even a pair of associate teams. There is ample slack in the scheduling to include more teams and more matches. Having multiple matches ensures that an early finish, or dud game allows the viewers other options. In a world of multi-channels, it would be easy to add an extra $20-30 million to the rights value of the world cup. Instead we are treated to empty, drawn-out schedules and the sense of a tournament grinding instead of accelerating to a conclusion. It is taken as an article of faith that because India will play 9 matches in the next world cup, the ICC will earn more from the tournament than a tournament with more knockouts but potentially fewer Indian matches. The final column estimates the increase in audience for each type of match, from a 6x increase for Indian matches, to a 4x increase for a final. There is a somewhat significant multiplier for matches against Pakistan as well. The important point is the extra value of knock-out games: meaningful games. If we calculate the multiple of extra fans we can make some rough calculations on the size of the India tv audience for each format (assuming India makes the quarter-finals but no better). For broadcasters in India, and therefore more than a little dependent on how India performs: you win some, you lose some. The losses suffered when India exited early in 2007 were more than made up in their run to the final in 2011. But the risk of that in 2007 was high, the format was a dud, with few knock-outs, and a ludicrously long second round. But the added value of the long round-robin is not found in the tv figures. Knock-outs rate better (recalling too, that this is only India, and therefore only 2/3 of the total market). More matches can make up the difference, and there is plenty of room for more. And this table doesn't take into account the future value of a well produced and therefore more marketable format, nor the value in promoting to markets who find themselves with a local representative. While my preferred 20-team format is worth marginally less by the model, it is marginal (less than 10% probably). FIFA's 32 team world cup, while probably a step too far for cricket, makes up the difference by having 63 matches, even if India made an (unlikely) exit at the round of 16. The ICC can do better. Adding 5-10% to the value of a tournament because Indian matches are guaranteed to rate better in their biggest market, while ignoring the significant value of meaningful matches is a pathetic short-term return, and a long-term loss. The cricket world cup lasts a long time, but has fewer matches than it might, leaving all those supposed gains on the table. And yet those gains are pitiful when compared with the losses suffered by reducing the number of WT20 tournaments, or to their smaller members, by not pursuing the Olympic dream - one the IOC would back, given their weakness on the sub-continent. Coupled with the redirection of profits into the big-three, the decision to put the ECB's domestic schedule over the interests of every other member ought to be called out and examined. The associates have done a good job of showing the folly of the ICC on sporting grounds, but even they might be shocked at how pathetic the supposed financial gains are for their betrayal. Nothing says the world cup like incessant complaining about the presence of associates, the seemingly endless format, the predictability... Andrew Nixon (@andrewnixon79) and Russell Degnan (@idlesummers) get their rant on, covering some recent statements from ICC Chief Executive David Richardson, and the myths around larger and inclusive world cups. There is a little swearing. That out of the way, there is also a little news from the USA and Fiji (34:40). Direct Download Running Time 37min. Music from Martin Solveig, "Big in Japan"
World Cricket League Division 2 concluded with an epic final day that saw Netherlands over-take Nepal and Kenya surpass Canada to survive relegation. Andrew Nixon (@andrewnixon79) joins Russell Degnan (@idlesummers) to discuss what happened and the repercussions (7:20). We also look back at the Dubai Triangular (0:32) and the Asian T20 qualifier won by Oman (3:45). Some of the repercussions were shortly over-turned by an ICC about face. We go through that and the various bits of news from the ICC meeting (37:00), the tournament schedule for the coming year (52:00), and an apparent end-game for USACA. Finally we preview the cricket world cup, and the associate prospects there-in. (60:00). Prolific writer on associate cricket and newly appointed head of cricket for QTV sports, Tim Brooks (@cricketatlas) also comes on the show to discuss some of their initiatives and the challenges of providing tv coverage in the associate world (20:00). Some technical difficultes mean the sound quality isn't great, but it is worth a listen. Direct Download Running Time 66min. Music from Martin Solveig, "Big in Japan"